Seal trips at Burnham Quay07748 653900work Boat TripsDiscovery Charters offers fishing and seal watching wildlife trips which leave from Essex Marina and the Quay at Burnham-on-Crouch. The trips offer you the chance to get up close to nature and explore the remote and deserted creeks and inlets of the Crouch and Roach estuaries. This area is simply one of the best places to view our fantastic estuary wildlife. The seals are often as interested in us as we are in them and they will come surprisingly close to the boat. We have regular sightings of Marsh Harrier, Hen Harrier, Peregrine, Sparrowhawk, Kestrel, Merlin and even Short-eared Owls. Waders seen regularly include Brent Geese, Avocet, Curlew, Black-tailed Godwit, Grey and Golden Plover, Lapwing, Redshank, Greenshank, Knot, Dunlin, and Oystercatcher among others. Wildfowl include, Teal, Wigeon, Shoveler, Mallard and Shelduck. Some of the trips have a guide from the local RSPB, who will be able to point out the birds for you and also give you a lot of information on our seals. Discovery Charters also offer fishing trips. The fishing consists of mainly uptideing or downtiding in 10-15m of water with light lines and normally 8oz breakaway weights. As the Thames Estuary is made up of sand banks and gullies, there are quite lot of different species, with cod, whiting, thornback rays, dogfish, bass, smoothhounds and tope. Drift fishing is available in the summer for mackerel and bass. 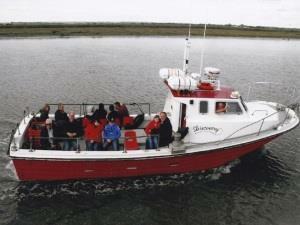 Discovery Charters offers fishing and seal watching wildlife trips which leave from Essex Marina and the Quay at Burnham-on-Crouch. Booking in advance is essential on these trips as they often sell out.